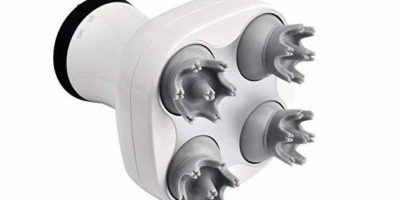 The first thing you’ll notice about the Stpollar handheld scalp massager is its unique design. Unlike other head massager models that use 4 attachments to provide a massage, this model uses no less than 126 nodes for the same purpose. 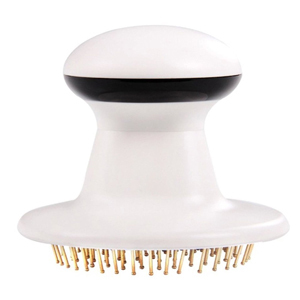 The brush-like design of the massager will help you run the massage nodes through your hair without getting it tangled, and it will deliver the massage pulses exactly where you want them. A good thing about this head massager is that it’s small and lightweight. This will allow you to wield the massager with ease, and you will be able to adjust its position using only one hand. The unit’s handle is ergonomically designed, so you won’t have any troubles grabbing it. One of the advantages of using this handheld massager is that it feels very good against your skin. 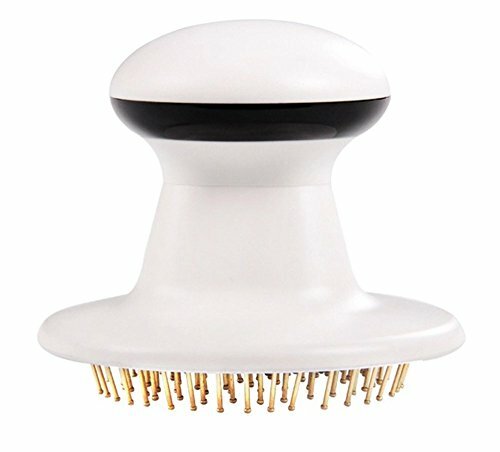 Whether you use the massager on your scalp, neck, shoulders, or even on your back, the needles will feel good and they won’t scratch your skin. Even though the massage needles feel pretty firm at first, you will be able to move them over your skin without scratching it, even if you apply more pressure. The material used to build the needles resembles rubber, but it actually has a firmer structure and it’s softer to the touch. Another advantage of using this handheld massager is that it produces up to 100 vibrations every second. Not only will the vibration make your scalp feel more relaxed, but it will also improve the local blood circulation and reduce your stress levels. Thanks to the increased blood flow, more blood will reach the vessels under your scalp. The blood carries more oxygen and nutrients to your skin, making it look better and stimulating your collagen production. This can lead to a stimulation of the hair’s growth, and it can also improve your skin’s appearance. Thanks to the increase in collagen production, your skin will look younger, without showing so many wrinkles as it did before. The Stpollar head massager comes with a 30-day guarantee. The manufacturer will replace all the units that present defects in materials or workmanship within 30 days from the purchase date. The customer is responsible for the return shipping costs. 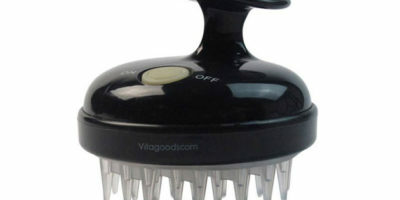 Good Design – The Stpollar head massager had a very good design. The 126 massaging needles produce a comfortable and soothing massage experience. Thanks to its well-thought design, running the massager through your hair won’t get it tangled. Good Vibration Massage – This handheld massager can produce up to 100 vibrations per second. The vibration massage is very beneficial for your skin and scalp, and using it constantly can improve the appearance of your skin and hair. This can be very beneficial for people who want to improve the way their skin looks. Short Guarantee Period – This product comes with a 30-day guarantee period. If you notice any kind of defects during this period, you can send the model back to the manufacturer for a refund or a replacement. However, you will have to cover the return shipping costs, which can be cost as much as half of what you pay for the product in the first place. Runs On Batteries – This handheld massager runs on AA batteries, so using it will increase the operating costs over time. To lower your expenses, you could try using rechargeable batteries, even if you have to take them out every time you want to recharge them.